Karina Hayat shares how she makes time for making a difference through focusing on her professional and personal priorities. 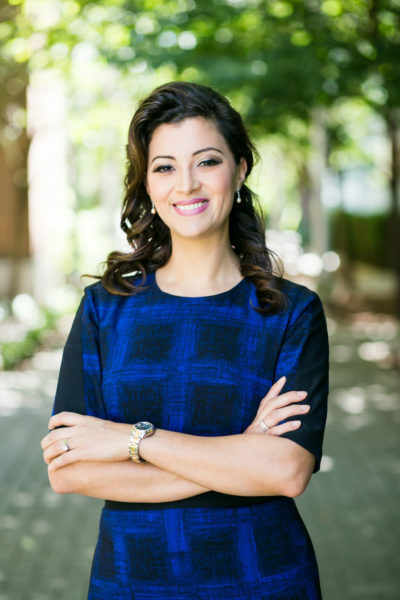 Karina Hayat is based in Vancouver, BC, where she is the president of a healthcare firm and a philanthropist dedicated to important causes and organizations such as 100 Meals a Week, and SHeAccelerates, a mentoring initiative focused on aspiring and early female entrepreneurs. She’s also a wife and a mom of 3. Karina met her husband when they were kids. They started a business together in college. They initially started out as an e-commerce platform for natural products which evolved into a health media firm that caters to pharmacies and medical equipment providers across North America. Their goal is to help those with chronic conditions by connecting them to health care services at the point of need, thereby reducing the time it takes to get access to medication or healthcare services. Karina and her husband are committed to the pursuit of purpose, so they do everything with the intention of helping someone else and leave a positive mark in another's life, whether that's through business or personal relationships. They are best friends. They have a pact of honesty in their relationship and in their business that states each person will let the other know if one is not carrying their weight. This has worked for them well because they are able to give each other constructive criticism, and they make sure to act upon these observations. They have a very strict boundary between work and home. It is a huge rule in the Hayat household to separate time in the office and in the home and to be present when they are with the kids. This doesn't happen all the time, but their children will act as referees and tell them when they start to talk about work-related topics. They work off of each other's strengths. Karina's strengths are in the written and verbal parts of the business and her husband's strength is strategy, so they collaborate with one another. When neither has a strength in a certain aspect, that's where they will hire it out. Outside of work, Karina and her husband are passionate about supporting certain causes and initiatives, such as the 100 meals a Week program. In 2006, they were invited to come out to one of the local malls during Ramadan to distribute food in Skid Row, and they saw how impactful it was. When they asked how often this event took place, they were told once a year. Knowing that people are hungry every day, she and her husband decided to do it every weekend and committed to doing this for their entire lifetime. In the winter months, they also drive around looking for people who are in need and distribute blankets and clothing. The two of them started this initiative, but they also invited family members and staff to participate. They also bring their kids along often so they can see the impact this effort has on other people. Starting in early 2018, Karina was able to block off Fridays to be dedicated to volunteer activities. She uses that time to prepare for 100 Meals a Week and other volunteer efforts, including a mentoring initiative called SHeAccelerates. Through SHeAccelerates, Karina helps women who are new or aspiring entrepreneurs by coaching and mentoring them. Karina takes on about two mentees on a yearly basis. It can be a meeting over a cup of coffee, a request to look over their business plan, or even an inquiry to invest in their business. It was done informally until recently, but for the past few months she's been collaborating with another woman who is motivated to grow the initiative into an organization. They have rounded up about 20 women who will come into the office on the weekends, and also a Q&A panel of female entrepreneurs who can give these women insights into how they can grow their careers and businesses. It's currently a local endeavor, but she has plans to open it up to an international audience through Skype. Karina's family is up by 6:30 am and the first thing they do is thank God for another day. Then she and her husband take turns getting the kids ready for school and getting ready to leave themselves. When they are all ready, Karina takes the kids to school. She is essentially at work during the hours that the kids are at school. At work, Karina handles compliance and partnerships, runs about 3-4 meetings a day, and makes many phone calls. When the clock hits 2:45 pm, she is out the door to pick up the kids. Once they get home, they have snacks and work on homework and have dinner. Depending on the day, she will either go work out or take the children out to do an activity. After that, they have some downtime including reading, taking baths, and getting the younger child to bed. She then spends some 1:1 time with her eldest to help her with homework. Once she gets into bed around 9:30, she and her husband spend some time together talking. She's generally asleep around 11 pm. Karina's biggest productivity challenge is when something unexpected happens. She and her husband are meticulous about putting everything on their calendars. The first thing that goes on their calendars is their personal lives such as her kids' school schedules such as their days off, early dismissals, holidays, field trips, etc., medical appointments, date nights, and workouts. Then, they will include the business component to it. After that, there's only a little bit of room left for extras. So when family emergencies happen, she has all these commitments and things you've said yes to, and there is bound to be something they have to give up. If their calendar weren't so structured, things would be easier to maneuver, but at the same time, Karina says this structure creates more flexibility because she knows which pieces need to be adjusted. Karina and her husband each have their own calendars, and they also have a family calendar. All of them are integrated with her email as well as her Zoho suite, which allows her to see everything that goes on in all levels of the company from HR, sales, and IT. So, if anything needs to be moved around, there is transparency in the scheduling process. She has her digital calendar on her smartphone and gets a lot of notifications all day. In order not to be distracted when she's talking with her children or colleague, or in the middle of work, she will put her phone face down, and keep the ringer off. She also has a headset on one ear when she is not in a meeting so she will hear the notifications, but not disrupt everyone else around her. As for task management, she uses a mix of her calendar, the project management software in the Zoho suite for long-term projects, and a sprint planning account for agile planning for IT projects and personal projects that require quick delivery. When she's stressed, she'll belt out a song since she loves to sing, work out, or go for a walk or drive. For Karina and her husband, their faith is important as well. They have the core belief that everything happens for the good and for growth. Whenever they start doubting that, they'll say an extra prayer, ask for guidance, and things work themselves out. At their office, they have a tradition that they call the “huddle,” where they share personal things, which allows everyone to get to know one another on a deeper level. One of the questions that they discussed was “What is your life mantra or favorite quote?” For Karina, her favorite quote is by Rumi: “As you start to walk on the way, the way appears.” If you sit and do nothing, things will not move forward. So you have to do something to create something. She also believes that sitting back to collect your thoughts and figure out what you're doing and what is affecting you counts as taking baby steps towards growth. What’s on the horizon for Karina? Karina's company is launching RxtoMe in Canada. This is a project they've been working on for about a year. People with chronic conditions will be able to order medication using the app, track their medication, and share the information with a physician or pharmacist. The prescriptions will be delivered to their door by providing their Personal Health Number and a pharmacist will ensure that it is billed to your insurance company. On the personal side, Karina and her husband are involved in many organizations that promote interfaith dialog, so she wants to bring more action into those organizations by creating more opportunities for dialog among the Jewish, Muslim, and Christian communities of understanding of one another and diversity engagement. I think the most important thing is for women to recognize that everything they do every single day matters. I find that a lot of the girls I mentor feel that they are not doing enough. They'll look at somebody like me and listen to a podcast like this and think “Oh my gosh, she's doing so much and I'm not doing anything with my life.” That is not the case. Whatever small thing you're doing, whether you're doing it on a small scale or large scale, just do it with 100% commitment and put your soul into it. And things will come out of it that will surprise you. Taking the time to do things for others doesn't necessarily mean you should forget about yourself. Your personal health and goals should always be a priority, because if you are not healthy you cannot help anybody else. For new moms who may be listening to the show, take the time to recollect yourself. You'll be a better woman, better wife, better mother for it. Any questions for Karina or me, or comments on the topics we discussed? Please share them in the comments section below this post or in The Productive Woman Community Facebook group, or send me an email. Karina and her family arrived in Vancouver from Guatemala as political refugees in 1991 with nothing more than two carry-on bags and a sheer determination to succeed. Today she runs a healthcare company with her husband and spends time giving back through various philanthropic endeavors. As a challenge-driven entrepreneur, Karina’s motivation comes from her commitment to making a difference in her community. She co-founded Prizm Media Inc., a healthcare tech firm, when she was 21 and has driven the bootstrapped company to success, ranking in Canada’s Growth 500, Ready to Rocket, and Deloitte 500. As the co-founder of RxtoMe, she aims to simplify the pharmacy experience by providing on-demand pharmacy services to people with chronic conditions and those caring for them. Through Karebox.org, she aims to serve the underemployed and invisibly homeless with Kare Packages that can make a lasting difference in their lives. Thank you to our sponsors TextExpander and UC Irvine Division of Continuing Education for helping me bring content to you at no charge.